Iran accuses foreign journalists of being "mouthpieces" for "hooligans"
TEHRAN, Iran (CNN) -- Iran on Wednesday accused international journalists in the country of being the "mouthpiece" of "hooligans" who have created unrest at post-election rallies in Tehran. 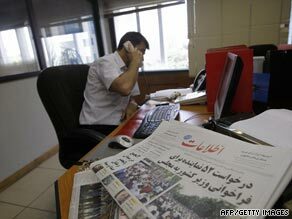 A foreign journalist speaks on the phone Wednesday in Tehran. "Hundreds" of international reporters were allowed into Iran to cover last week's election as "a sign of the total transparency in the trends of the elections and the effective performance of the system of religious democracy," the foreign ministry said in a statement. "But certain countries have rushed to judgment and have supported the illegal gatherings and the disturbances that a number of opportunists had created," the ministry said. "They have turned themselves into the mouthpiece for these hooligans, and have damaged and targeted the radiant face of the Islamic republic." Iran's Revolutionary Guard corps said Wednesday it will pursue legal action against Web sites that it said were inciting people to riot. Iran opposition defiant as media grip tightened? Even as the Guard made its announcement, thousands of Iranians planned to head to Haft-e-Tir Square in central Tehran on Wednesday evening despite a stepped-up government crackdown. The demonstrators, who back opposition leader Mir Hossein Moussavi, are demanding that the government throw out the results of last week's balloting that kept hardline incumbent president, Mahmoud Ahmadinejad, in power. Authorities in Tehran hauled dozens of protesters to jail Tuesday, banned international journalists from filming the rallies and blocked access to social networking sites, such as Twitter and Facebook.